Credit The Philippine Institute of Volcanology and Seismology. Mayon volcano has continued to spew red-hot lava and clouds of ash into the air after it exploded seven times in just 24 hours as residents report the sound of rumbling from the towering crater for miles. But the Philippines most active volcano shows no signs of letting up as officials revealed lava continued to flow from 7.19am on Thursday to 6am (local time) today erupting on seven separate periods during the timeframe. The Mayon volcano, which stands at 8,077 foot tall, is one of the most active in the Philippines and has continued to erupt for weeks. The Philippine Institute of Volcanology and Seismology reported: "It generated ash plumes that rose 300 metres above the summit crater before drifting southwest. These were accompanied by rumbling sounds audible beyond 10 kilometres of the summit crater. "At night, lava flows were observed to continue moving downslope within 3.3 kilometres, 4.5 kilometres and 1.9 kilometres from the crater on the Miisi, Bonga and Basud Gullies, respectively." The alert level for Mayon has recently been downgraded to three on a scale of five. Authorities said although the threat of further "hazardous explosive eruptions" is unlikely, locals and visitors must prepare for "unrest to continue". The Philippines sits on the "Ring of Fire" a large area in the basin of the Pacific Ocean where volcanic eruptions and earthquakes are frequent. Mount Mayon's last eruption took place in 2013 when four climbers and their guide died after trekking near the summit. 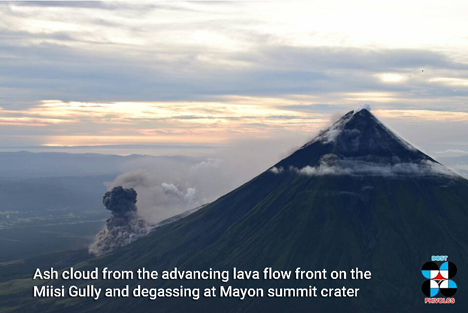 Most recent activity has forced nearly 70,000 people to evacuate from areas close to Mount Mayon to escape the threat of eruption. The tens of thousands of people have been forced to flee their homes after a thick grey cloud coated villages in affected areas following two weeks of eruptions. Around 75,550 people have been evacuated to overcrowded relief camps as authorities warn residents far from the area to stay indoors to avoid heavy ash fall.